Changes in plasma aldosterone with upright posture. 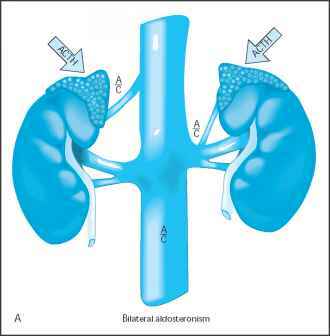 A-C, Depicted are individual data for persons showing temporal and postural changes in plasma aldosterone concentration in normal persons (panel A), and in patients with primary aldosteronism owing to a solitary adrenal adenoma (panel B) or to bilateral adrenal hyperplasia (panel C). Blood is sampled at 8 AM, while the patient is recumbent, and again at noon after 4 hours of ambulation. In normal persons the increase in plasma renin activity associated with upright posture results in a marked increase in plasma aldos-terone at noon compared with that at 8 AM (see Fig. 4-4). 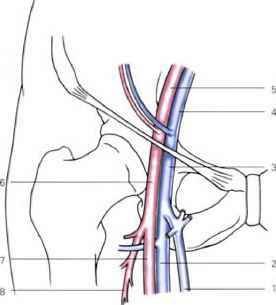 In adenomatous primary aldosteronism, the plasma renin activity is markedly suppressed and does not increase appreciably with upright posture. Moreover, aldosterone production is modulated by adrenocorticotropic hormone (which decreases from high levels at 8 AM to lower values at noon (see Fig. 4-4). Thus, these patients typically demonstrate lower levels of aldos-terone at noon than they do at 8 AM. In patients with bilateral adrenal hyperplasia, the plasma renin activity tends to be more responsive to upright posture and aldos-terone production also is more responsive to the renin-angiotensin system. Thus, postural increases in aldosterone usually are seen. Exceptions to these changes occur in both forms of primary aldosteronism, however, making the postural test less sensitive and specific .